Kiln Sitters are the control boxes on electric (or manual) pottery kilns that utilize pyrometric cones to dictate a kiln’s firing. Prongs within the kiln sitter extend to support a pyrometric cone or rod. Once the kiln reaches a specific temperature, the cone will start to bend, causing a lever to drop, switching the kiln off. While kiln sitters have become less common with the advent of digital controllers, they are still found on many manual kilns -- and like any piece of hardware on a kiln, these items sometimes need to be repaired or replaced. Here at The Ceramic Shop, we carry complete kiln sitter kits, as well as the individual kiln sitter parts for your convenience. Important components of kiln sitters include the tube assembly, cone supports and the sensing rod, to start. Kiln sitters are also available either with or without a timer. If you have an older kiln, you may find yourself in the position to need to replace just one of these parts, rather than your entire kiln sitter. 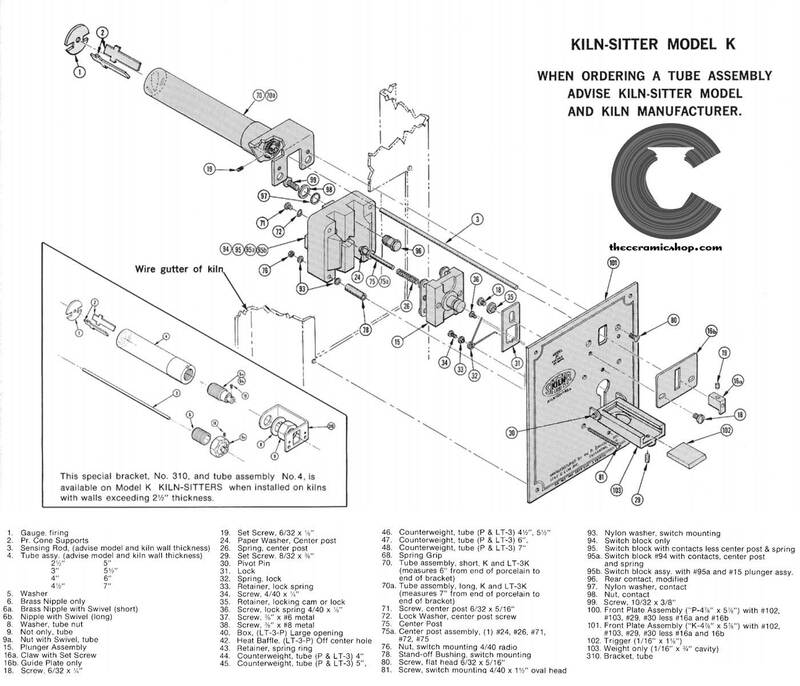 We carry these parts (and more), but for those new to repairing older kilns, one of the challenges is simply understanding each part of the kiln sitter assembly. Below you will find a list of the most commonly-replaced parts of a kiln sitter for your convenience -- if you need help ordering a part please use this as a quick guide, or call one of our specialists today! The TUBE ASSEMBLY is the hardware that connects your kiln sitter controls, seen on the exterior of your kiln, to the spot where you place your sitter cone on the inside of your kiln. Tube assemblies come in a few different varieties; click here to navigate to our tube assemblies page. CONE SUPPORTS are the two flat metal pieces that prop up your sitter cone within the tube assembly. These are tiny items, but occasionally, we see customers who need them replaced due to a sitter cone overfiring and fusing on to the metal. These are very quick and easy to fix -- just slide them out and replace them! A SENSING ROD is the rod that rests over your sitter cone when you set it upon the cone supports to start your kiln. As your sitter cone melts, this rod places pressure on the softening ceramic material, ultimately causing the kiln to shut off. As kilns come in a variety of sizes, so do sensing rods -- something to keep in mind when you are replacing the sensing rod in your kilns sitter. The kiln sitter's CLAW is the tiny latch mechanism that hooks on to the kiln's switchplate (found on the exterior) when you place a sitter cone onto the cone supports. The claw actually fits on to the external end of the sensing rod, completing the latch mechanism and causing the external latch to drop when the sensing rod sinks down onto the melting sitter cone. At The Ceramic Shop, we stock most kiln sitter parts. If you are unsure of what you need, or if you do not see what you are looking for, please feel free to contact us and one of our skilled kiln technicians will be happy to find the kiln sitter part that you need. If you are looking for tube assemblies, gauge washers or cone supports, please click here. We sell all the parts for the Dawson kiln sitters, most in stock. Feel free to call to speak with a kiln technician today!